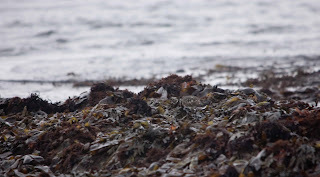 You remember how well the Black Oystercatcher can blend into seaweed? Well, that’s nothing. There is a bird in the picture below. Can you see him? 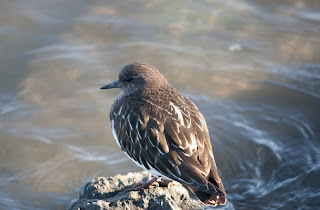 Black Turnstones blend really well. They blend with seaweed, they blend with rocks. I barely saw one standing on this rock below. 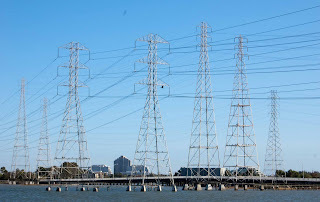 I was hanging out at Ryder Court Park in San Mateo, CA looking out over the water. I looked down and saw this! There were two of them sitting on rocks looking out at the water. They looked so peaceful. 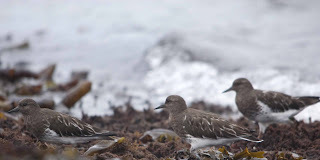 Turnstones eat mollusks, marine worms, etc. so they’re frequently found foraging in seaweed. 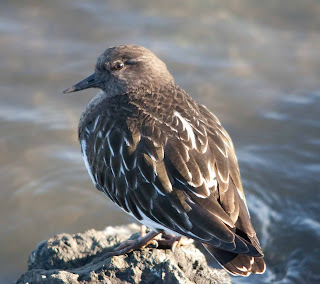 The name “turnstone” is a reference to their habit of turning over stones, looking for food underneath. If you look carefully, their beaks are slightly upturned to push under stones. They like to forage in groups. These pictures were taken at the Marine Fitzgerald Preserve in Moss Beach, CA. 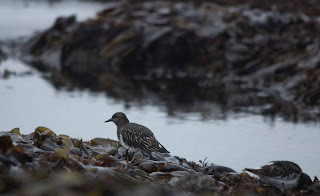 What good info on the turnstones! Animal camoflage is amazing, isn't it! Thanks Kathie! One of the reasons that I love birding is that the more experienced you become, the more birds you see. I like being able to see through the camouflage.